A meta-analysis published in October, 2013 in the Journal of Alternative and Complementary Medicine (2013;19(10):1-12) found that the Transcendental Meditation®technique (TM) has a large effect on reducing trait anxiety for people with high anxiety. Trait anxiety is a measure of how anxious a person usually is, as opposed to state anxiety, which refers to how anxious we are at the moment. 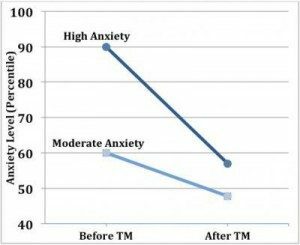 This chart shows that studies of individuals with anxiety levels in the 90th percentile (higher than 90 percent of the rest of the adult population) showed dramatic reductions in anxiety down to the 57th percentile from TM practice. This is just a little higher than the average anxiety level, which is the 50th percentile. Study groups that started in the 60th percentile, a little above average, showed more modest reductions, to the 48th percentile, a little below average.